A man has pleaded guilty to the attempted murder of a father injured in a triple stabbing which left his wife and 13-year-old son dead. 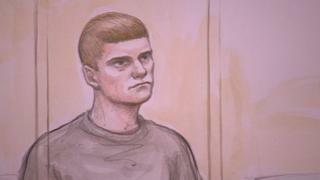 Aaron Barley, 23, admitted trying to kill Peter Wilkinson in Stourbridge on March 30. He entered no pleas to two charges of murder, relating to Mr Wilkinson's wife, Tracey, and son Pierce. Mr Barley was remanded in custody by a judge at Birmingham Crown Court. The case was adjourned until 19 July. A provisional trial date was set for 3 October.